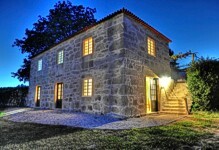 This beautiful, moderm villa offers wonderful facilities in an excellent location in northern Portugal. The interior was entirely re-fitted a few years ago. It now offers all modern conveniences whilst retaining the building's original character. Casa do Tanque is part of a large wine-producing estate. There are 3 self-catered villas on the estate - Casa do Alpendre is completely independent and this villa and Casa de Luou are located close to each other and share a swimming-pool. The villa is spread over two floors. The ground floor has a fully-fitted modern kitchen and a large living/dining room with a traditional stone fireplace. The villas's three bedrooms are on the first floor. The double bedroom has ensuite shower room. The 2 twin bedrooms share a large bathroom. The villa has been beautifully furnished in a warm, Mediterranean style. Surrounded by beautiful countryside this villa offers spectacular views. There are numerous areas within the grounds from which to enjoy the views and the peaceful setting, including an outdoor dining area. The elegant swimming pool is set in a large lawned garden with sun-loungers. This is shared with guests staying at Casa de Luou. Casa do Tanque is located approximately 6 kms away from the small historical and charming town of Ponte de Lima with an abundance of traditional shops, bars and restaurants. The River Lima, where guests can swim in sparkling fresh water, is approximately 800 metres away. The old sailing city of Viana do Castelo is approx. 20 kilometres away. Viana has many excellent restaurants, bars, cinemas and a shopping centre. There are also good motorway connections to Braga, Guimaraes and Porto. Ponte de Lima golf course is a few kilometres from the house and has an excellent restaurant. Porto International Airport is approximately 70 kilometers away. Casa do Tanque and Casa de Luou, which can accommodate another 8 people, can be rented together for large groups or families.